We analyze a study that says fasting could help with MS. Multiple sclerosis (MS) is an autoimmune disorder characterized by muscle weakness and numbness, as well as problems with vision and bladder control. It is caused by the immune system attacking nerve-insulating myelin sheaths, which disrupts the communication between the brain and peripheral parts of the body. The disease is generally classified as either primary progressive MS or relapsing-remitting MS.
Primary-progressive MS is characterized by a progressively worsening neurological function that is evidenced by continuous symptoms, although these may change over time. Relapsing-remitting MS is characterized by clearly defined episodes that are separated by periods of remission from the disease. During remission there is a complete absence of symptoms with no apparent progression of the disease. Oligodendrocytes are glial cells that help create the myelin sheath around nerve axons in the central nervous system (CNS). These cells are critical for the development of the brain and ensure correct functioning of the nerve cells. The myelin sheath they produce acts as insulation that protects long nerve projections (known as axons) and facilitates the conduction of nerve signals. During MS there is a loss of myelin in defined areas—known as lesion sites—in the brain and spinal cord. The process leading to lesions is summarized in Figure 1. MS is characterized by a large array of invading immune cells, such as T-cells (tissue-infiltrating immune cells), B-cells (cells that secrete antibodies) and macrophages (a type of white blood cell that engulfs other cells and molecules). These cells attack and degrade the myelin sheath, the myelin-producing oligodendrocytes, and the nerve axon. Lesion sites develop over time and initially result in clinically benign symptoms, but they progress to significant disabilities. The long-term impact of MS treatments is unclear, as most MS drugs manage symptoms and do not reverse neurological damage. Although they have shown efficacy, these immunosuppressive drugs often come with severe side effects. Effective and safe treatments are in high demand and are required to mitigate autoimmunity, but also to stimulate regeneration and restore lost functionality. Some studies on animal models of MS have suggested that various forms of dietary restriction, such as calorie restriction, intermittent fasting and the ketogenic diet, protect neurons and reduce inflammation. Studies have also shown that periodic fasting can improve cognitive function and reduce oxidative stress. A new study utilizing a diet that mimics fasting was tested to determine its effects on autoimmunity and inflammation. Multiple sclerosis is an autoimmune disorder of the central nervous system during which the immune system attacks and destroys the myelin sheath around nerve axons. Most treatments for multiple sclerosis are immunosuppressive and do not alleviate autoimmunity or regenerate the damage already caused. New research hopes to determine the role diet and nutrition could have on overcoming multiple sclerosis. Many researchers use a disease model known as experimental autoimmune encephalomyelitis (EAE) to study multiple sclerosis. This is a demyelinating disease of the CNS in mice and shares many clinical similarities with MS. To induce EAE, animals are injected with myelin antigens mixed with compounds to stimulate the immune system into autoimmunity. In this study, mice were immunized as described to induce EAE between eight and fourteen days post-injection. At the onset of EAE symptoms, the mice were put onto a diet called a fasting mimicking diet (FMD). The feeding schedule consisted of 50% of their normal calorie intake on day one and 10% of their normal calorie intake on day two and three. The mice returned to a normal diet on days four through seven. This cycle was repeated three times. In between each cycle, there was a four day period where mice were given their normal diet. The total test period was 29 days and mice were analyzed on a daily basis for clinical symptoms. To ascertain the effect of a similar diet in relapsing-remitting MS patients, a randomized parallel-design clinical pilot trial was carried out. Patients were randomly allocated to three different groups, with 20 patients in each group. One group was provided seven days of FMD followed by six months of the Mediterranean diet. In the second group, patients were tested on a ketogenic diet (KD) for six months. Both groups were controlled against a third group, in which participants were told to maintain their normal diet for six months. Similar to the mouse studies, the human FMD involved a very low calorie diet of 800 kcal on day one, followed by just 200-350 kcal on day two to day eight. Food was stepwise reintroduced on day nine to eleven. Participants in the KD group were advised to eat less than 50 grams of carbohydrates, more than 160 grams of fat, and less than 100 grams of protein daily. The primary outcomes included quality of life analysis, as well as composite scores for physical and mental health parameters. Participants also had blood taken for analysis of circulating white blood cells. Scientists tested the effects of the fasting mimicking diet as a treatment on a mouse model that replicates MS. Furthermore, this diet was tested on human participants suffering from relapsing-remitting MS to determine whether it was effective, safe, and feasible. The effect of FMD against the development of EAE in mice was examined in the context of disease severity. The application of three cycles of FMD reduced disease severity regardless of when FMD was started. If FMD was applied after 10% of the animals developed EAE, there was a delay in disease onset and a significantly reduced incidence rate, from 100% down to 45.6%. If FMD was applied after 100% of the population had EAE, there was a complete reversal of symptoms in 21.7% of the population. To examine the ability of FMD to reduce autoimmunity, circulating white blood cells were measured. FMD caused a temporary 40-50% reduction in all white blood cell types. In addition, spinal cord sections showed that mice treated with FMD had a 75% reduction in markers for inflammation (CD11b+ cells) compared to mice on the control diet. Myelin-specific effector T-cells (CD4+ and CD8+ T-cells), which migrate into the CNS and initiate demyelination, were also reduced after the FMD diet. By counting cells in spinal cord sections, CD4+ cells were shown to be reduced from 8.6% to 1.5% and CD8+ cells were reduced from 1.3% to 0.4%. There was a reduction in demyelination in FMD-treated mice, which was hypothesized to be due to enhanced oligodendrocyte regeneration. Oligodendrocytes are the cells that produce the myelin sheath in the CNS. Quantitative analysis of spinal cord sections showed that there was significant reduction of 30.4% in the number of mature oligodendrocytes in mice in the control group compared to the mice in the FMD group. To investigate whether the results in the animal study could be replicated in humans, a randomized pilot trial was carried out in participants suffering from relapsing-remitting MS. 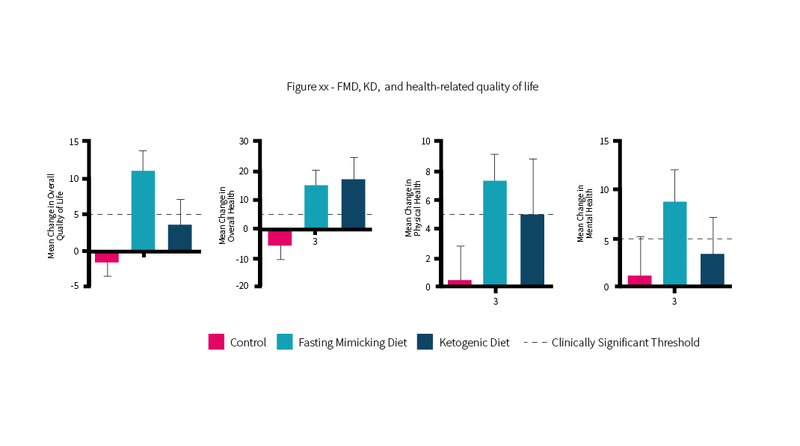 Patients that were prescribed either a fasting mimicking diet or a ketogenic diet showed meaningful improvements in health-related quality of life scores after three months, with specific results shown in Figure 2. This included a clinically significant five point improvement over the threshold in overall quality of life of those in the FMD group. In addition, the FMD group had positive changes of ten, two and four points over the threshold in change in health, physical health, and mental health scores, respectively. The KD group on the other hand were observed to only have improvements in the overall change in health scores. Here, there was a clinically significant eleven point improvement over the threshold. The scores for quality of life, physical and mental health hovered around clinical significance and although the mean was below, the error extended beyond the clinically significant threshold. To analyse the immune response in relapsing-remitting MS patients, blood samples were collected from each group. There was a slight reduction in lymphocytes and white blood cell counts with a significant reduction of approximately 20% in total lymphocyte count in 72% of the FMD group. However, this lymphocyte reduction reverted back to normal three months after switching to the Mediterranean diet. With regard to the ketogenic diet group, there was no significant change in lymphocyte count from the baseline level. FMD administered for three cycles was effective at ameliorating symptoms in a mouse model of MS. FMD mediated these effects through immune suppression and oligodendrocyte regeneration. When tested in patients with relapsing-remitting MS, there were clinically significant improvements in health and disability scores after three months. 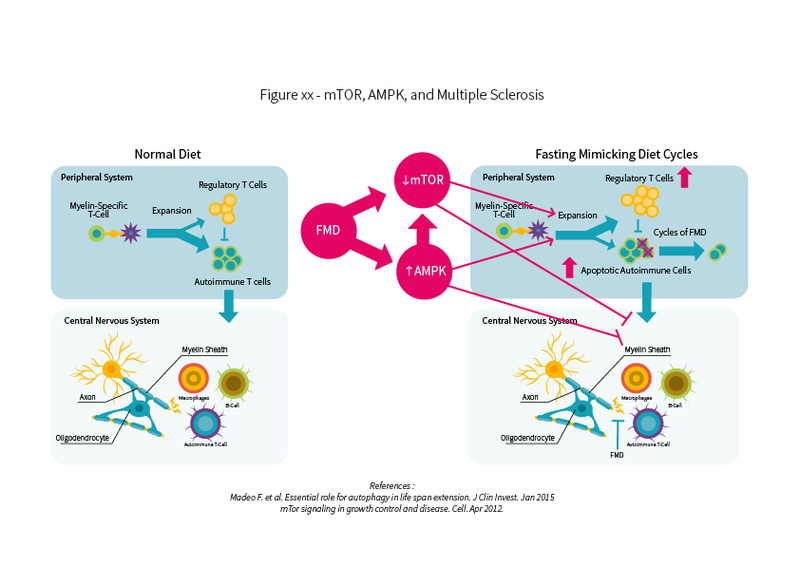 Three cycles of a fasting-mimicking diet treatment reduced disease severity in an animal model of MS. This diet likely worked by reducing the number of circulating immune cells that migrate to lesion sites and cause demyelination. As previously shown, prolonged fasting comes with a substantial stress burden, as well as longevity-enhancing benefits. By cycling periods of fasting and feeding, several cell types associated with multiple systems are regenerated. With promising results in the animal model, the researchers extrapolated that this diet may be clinically relevant for humans with MS. When FMD or KD was given to relapsing-remitting MS participants, it was observed to be safe and well-tolerated with high compliance rates. There were positive changes in health-related quality of life scores as well as improvements in physical and mental scores in the FMD group. However, these mild improvements were the result of a single cycle of FMD and so further studies on multiple FMD cycles in MS patients would be necessary to determine whether FMD could be more effective. The KD group on the other hand was not as effective as FMD at improving physical or mental scores, but there was a significant change in the overall health score. This suggests that KD has at least some positive effects on those with relapsing-remitting MS.
By cycling feeding and fasting, biomarkers for autoimmunity and inflammation were reduced in an animal model of MS. Translation into humans resulted in only mild improvements. However, this occurred after only one fasting cycle. Further cycles of the FMD may support the use of this regime for people suffering from relapsing-remitting MS. In mammals, the cycling between fasting and fed states changes the levels of circulating nutrients and growth factors. As such, metabolic processes change between energy-consuming (anabolic) and energy-producing (catabolic) pathways. A main driver in regulating this is the mTOR signaling pathway, which integrates a variety of environmental cues to regulate metabolic homeostasis. In nutrient-rich conditions, mTOR is activated. In nutrient-limiting conditions, it is inhibited. mTOR has been shown to play a key role in controlling glucose and lipid homeostasis through its signaling cascade. Various forms of dietary restriction have been shown to be robust interventions that increase the lifespan of a variety of organisms, from yeast to monkeys. The protective mechanism is hypothesized to be mediated through the aforementioned mTOR signaling pathway, which has many downstream actions that could be relevant in cancer, obesity, diabetes, and neurodegeneration. It is therefore possible that FMD benefits autoimmunity through modulation of the mTOR pathway. Although plausible, this is speculative. It is also possible that FMD causes an anti-inflammatory effect through the up-regulation of a protein known as AMPK, as shown in Figure 3. AMPK is a highly conserved energy sensor that senses fluctuations in glucose availability and activates a signaling cascade that is involved in breaking down fat and suppressing inflammation. With the fasting-induced shift from glucose to fat oxidation—as is observed during fasting or carbohydrate restriction—AMPK stimulation may repress inflammatory responses, such as those present in conditions like MS or in chronic lifestyle diseases like diabetes and obesity. Stimulation of the AMPK pathway has been demonstrated to be important for the activation of anti-inflammatory signaling pathways and thus is a promising pharmacological target for many disorders associated with inflammation. All living organisms depend on dynamic mechanisms that assess and adapt to their energy status and demand. The proteins mTOR and AMPK play prominent roles in maintaining homeostasis and are implicated in pathological states such as cancer, obesity, neurodegeneration, and aging. These proteins may play a role in the benefit of fasting-related diets for conditions like MS.
What are the differences between intermittent fasting, alternate day fasting and the fasting mimicking diet? As a means to weight loss, intermittent fasting (daily 12 to 20 hour fasts) or alternate day fasting (one or more 24 hour fasts in a week) can be incorporated into daily routines and have been shown to be effective in losing weight. The FMD diet was originally developed to improve health without the risks of a prolonged fast of 72 hours or more. The FMD would appear to rejuvenate multiple systems within the body and as recently reported, may impact systems involved in cancer, autoimmunity issues, and inflammation. Would the fasting mimicking diet be beneficial if it was done continuously without resuming normal feeding? 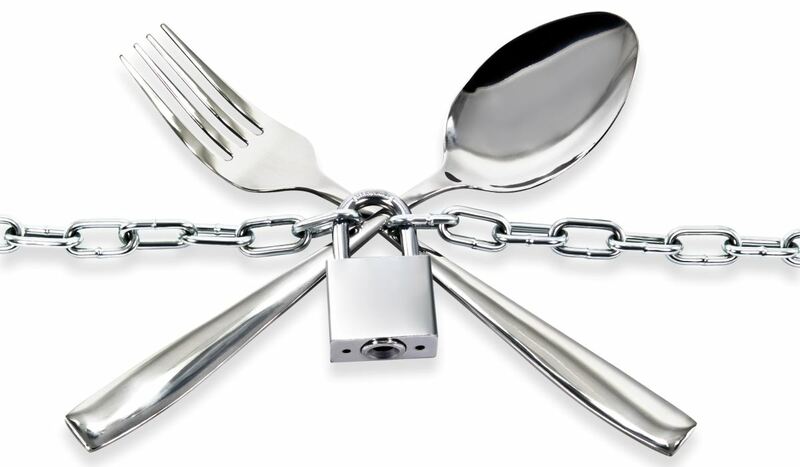 The researchers believe that the fasting mimicking diet works because it is conducted in cycles. This is because during the fast, the disease-causing immune cells are essentially stopped and killed off. When normal feeding is resumed, normal immune cells and the myelin-producing oligodendrocytes are regenerated. Together, this process of cycling is how some of the mice in the study became disease-free. It is important to note that a larger study in humans is required to further establish how diet and autoimmunity interact, particularly in a disease setting. Studies have shown that fasting and low carbohydrate diets such as the ketogenic diet directly promote autophagy. This is the process by which the cell destroys waste products and dysfunctional cellular components. Often described as the garbage bin of the cell, this process recycles waste that may otherwise damage the cell. Several studies have shown that enhancement of autophagy can increase the lifespan of many different organisms. Longevity-promoting regimes that are associated with autophagy include fasting and calorie restriction, which have been shown to inhibit the mTOR pathway. As previously described, the mTOR signalling pathway is implicated in several age-related disorders. Researchers investigated a diet that mimics fasting, and found that it reduced symptoms in mice that had an experimental disease model similar to MS. The fasting mimicking diet caused a complete recovery in some of the mice and further analysis revealed fewer invading immune cells. In addition, FMD reduced levels of markers for inflammation, and there were observations of myelin regeneration at lesion sites. In the second part of the study, FMD was tested on human participants with relapsing-remitting MS, and the researchers noted some improvements in quality of life and disability scores for participants who were on FMD or KD. Want to stay up-to-date on the latest in nutrition and supplement research?Click here to subscribe to our monthly Examine.com Research Digest for as little as $24.99/month.